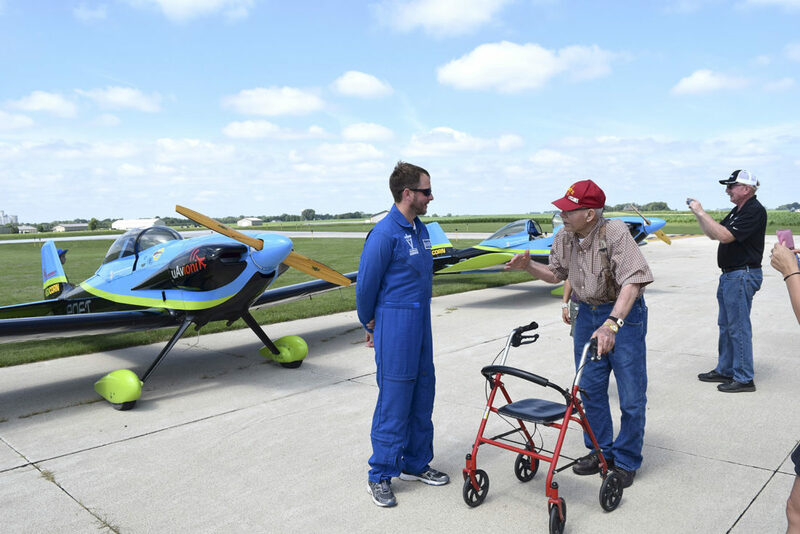 Virgil Ricklefs, of Rolfe, speaks with Mark Ketcham of the Vanguard Squadron aerobatics team after their air show Sunday morning in Pocahontas. 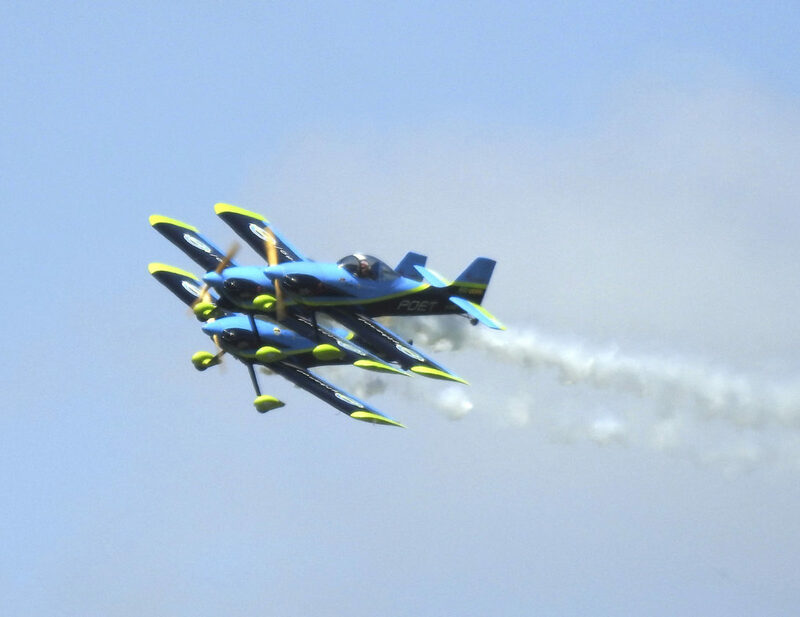 The squadron performs at air shows across the state, and was here with help from the Iowa Corn Grower’s Association. The planes fly fueled by 100 percent ethanol. 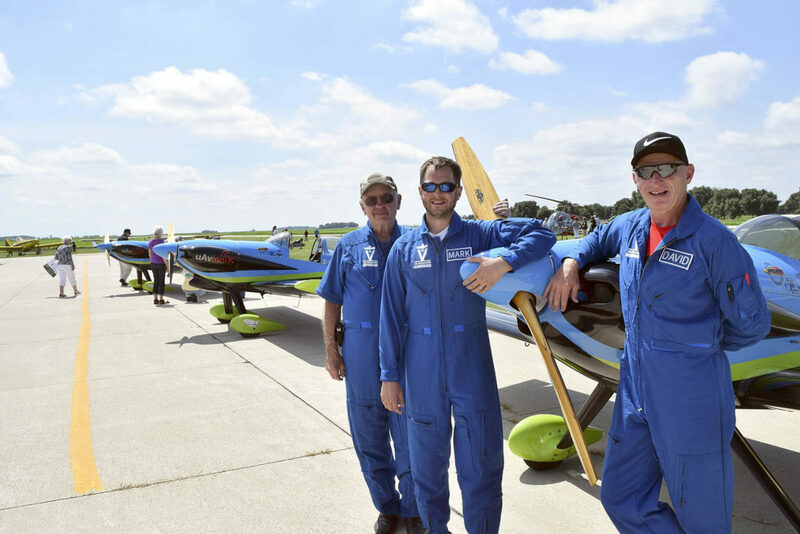 Stunt pilots Steve Thompson, left, Mark Ketcham and David Myers come back to earth after entertaining the crowds Sunday morning as the Vanguard Squadron aerobatic team, at the Pocahontas airport as a finale to Pocahontas Heritage Days. Alan and Denise Core, of Indianola, look over the instruments of one of the kit-built RV-3 aerobatic planes of the Vanguard Squadron that put on an air show in Pocahontas Sunday morning. The Cores flew in earlier that morning in their own Cessna for a fly-in breakfast at the Pocahontas airport. Dennis Dahl, of Pocahontas (left in the hat), talks to visitors about his 1956 Bell 47 G-2 helicopter, which he keeps at the Pocahontas airport. Dahl has had it for 20 years; before he bought it the craft was used for crop dusting in California, and was sent to Puerto Rico for a time. Members of the Vanguard Squadron take off one after another at the Pocahontas airport Sunday. 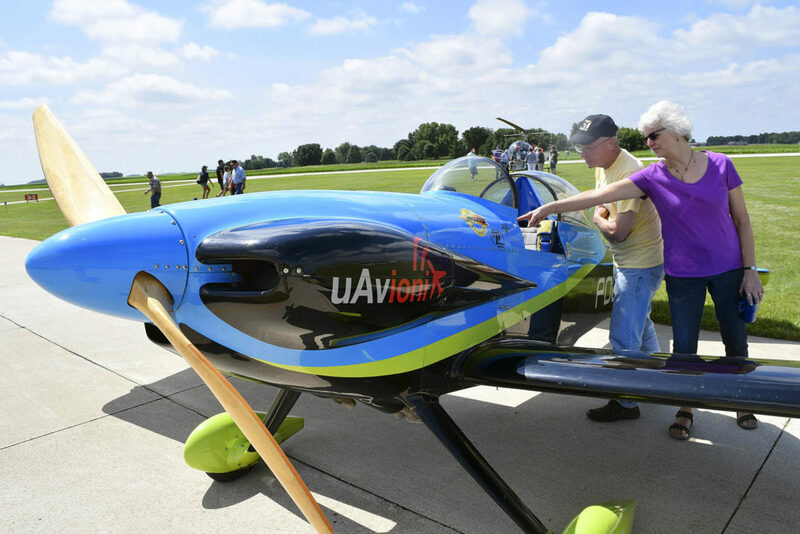 Planes and pilots from all over flew into the Pocahontas airport Sunday morning for a free pancake breakfast—including this two-cycle powered ultralight—and to watch the aerobatics show put on by the more powerful planes of the Vanguard Squadron. 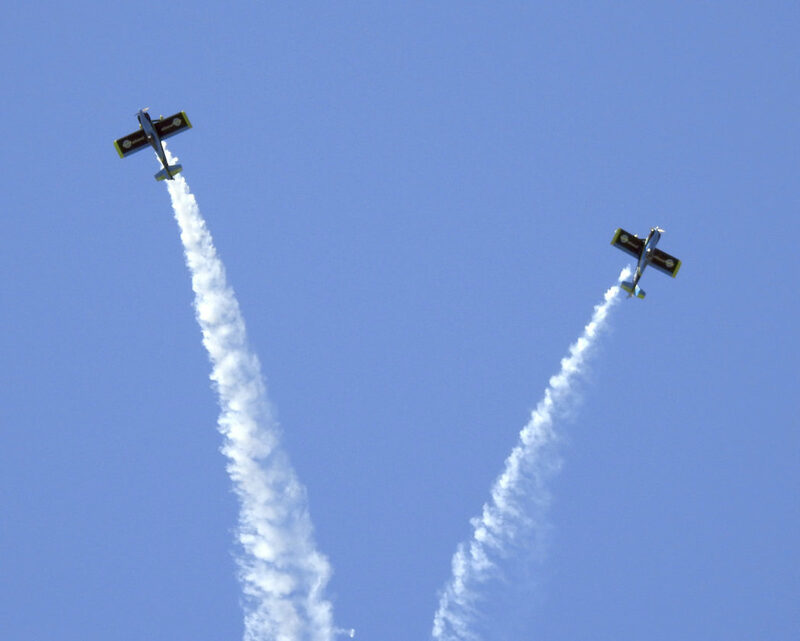 Three Vanguard Squadron planes come so close they seem on top of each other during the air show at Pocahontas Sunday, in this photo by Sheryl Runneberg of Spencer. Pilot David Myers said the planes could be as close as 8 feet together and traveled around 150 mph during the show. -Submitted photo by Sheryl Runneberg Aerobatic pilots split in the sky over Pocahontas as the Vanguard Squadron puts on an air show Sunday. 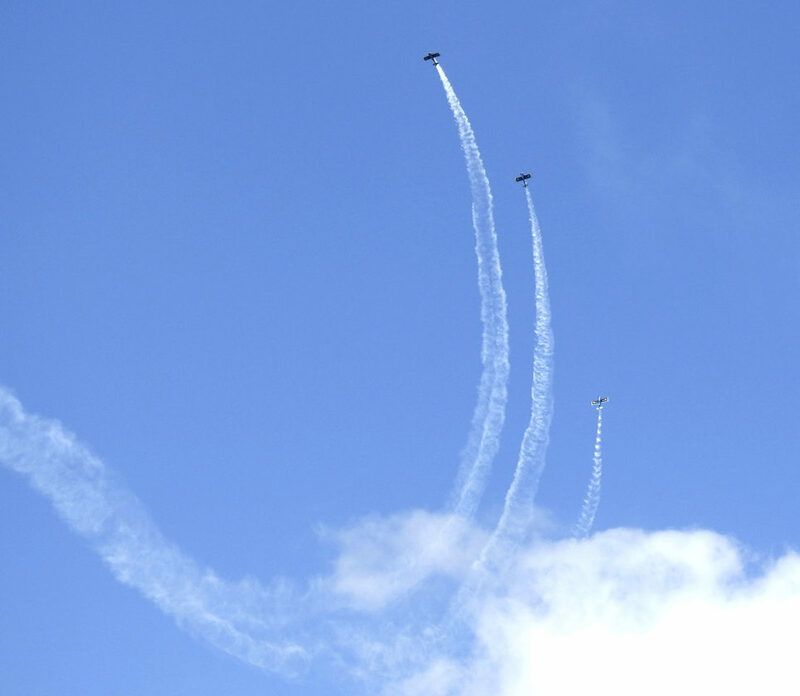 Stunt planes carve three tight curves through the sky as the Vanguard Squadron puts on a high-speed, ethanol-powered air show for the crowd in Pocahontas Sunday morning. POCAHONTAS — Aerobatic aircraft filled the skies north of Pocahontas for a fast-moving finale to Pocahontas Heritage Days Sunday morning. Stunt planes from the Vanguard Squadron, of Tea, South Dakota, were the special attraction, swooping through the air to the delight of the crowds following a fly-in pancake breakfast earlier at the airport. In fact, it was through partnership with the Iowa Corn Grower’s Association that Pocahontas was able to book the team this weekend, said Pocahontas Airport Commission Chair Gary McCartan. Over the years the airport has done quite a few fly-in breakfasts, where anyone arriving by plane gets free pancakes, but not too many air shows. 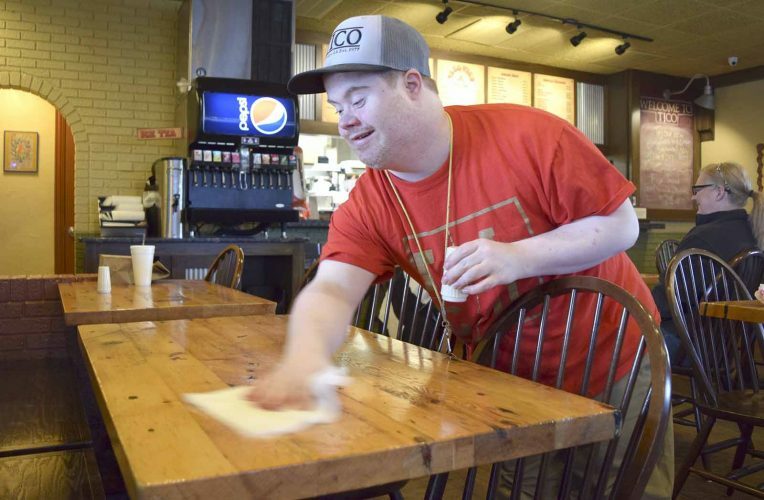 “It ain’t easy,” McCartan said. It takes about four or five months to get approved, he said. After submitting a heavy load of paperwork to the FAA, the commission had to wait. “We didn’t know until Wednesday we’d be able to have this,” he said. Myers and the rest of the team travel throughout the summer; this year they’ll put on about 10 shows, he said. The group practices once or twice a week, Myers said. It takes a pilot about a year and a half to get “spun up” to being a qualified stunt pilot, including FAA certification and other requirements. 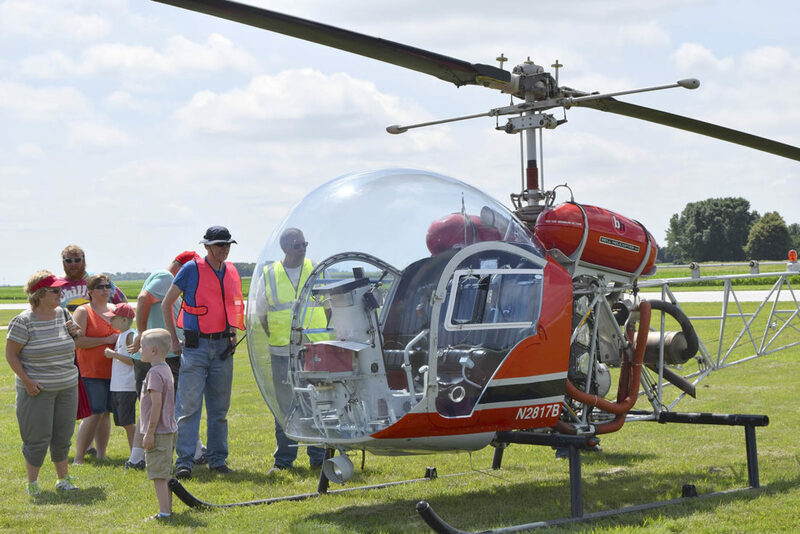 Kids and adults alike could come up afterward to see the home-built RV3 aerobatic planes, plus others that had flown in for the day — and one 1956 Bell helicopter. The helicopter didn’t come far — it just flew from the hanger to the field at the Pocahontas airport, said Dennis Dahl. He’s owned the chopper for about 20 years. Before he bought it, the bug-shaped rotorcraft had been all over the country. Skylar Ahlrichs, 8, of Pocahontas, had one word for seeing the helicopter up close. He felt about the same way about the air show itself. Bill Ingwersen, of Laurens, heard about the show last-minute and came down with his family. Emilia Ingwersen, 5, loved seeing the show as well, but she was also interested in the working aircraft. 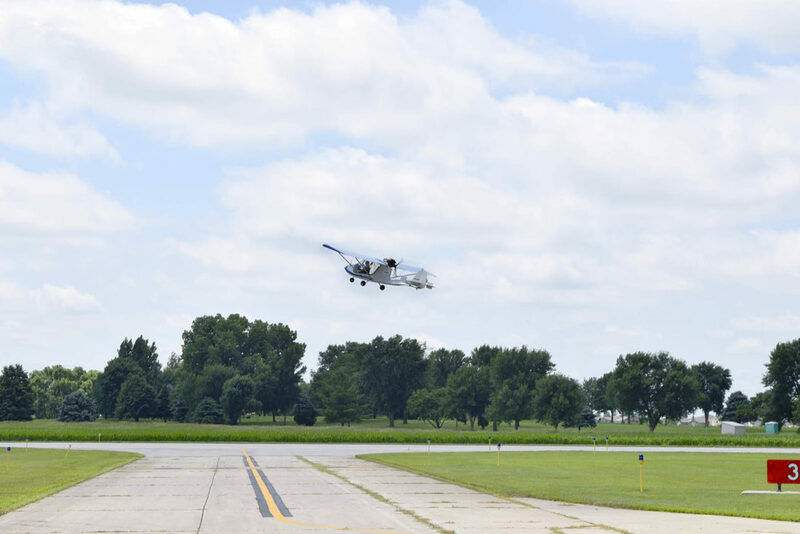 “We chase those ag planes around at home, and she really wants to see those close up,” Bill Ingwersen said. A number of yellow crop dusters were indeed sitting on the grounds, just waiting to be looked at. 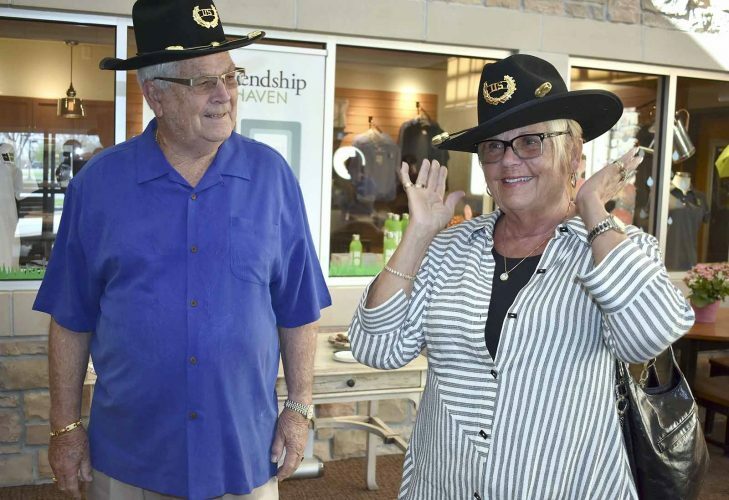 Will the town get another air show in a couple years for its 150th celebration? 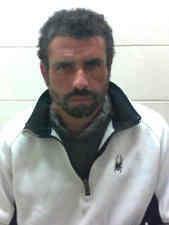 People have already been asking him, but McCartan said it’s not a sure thing. It takes a lot of work to put one together, and there has to be some way of funding it other than ticket sales. Introducing kids to the wonders of flying is important to him. 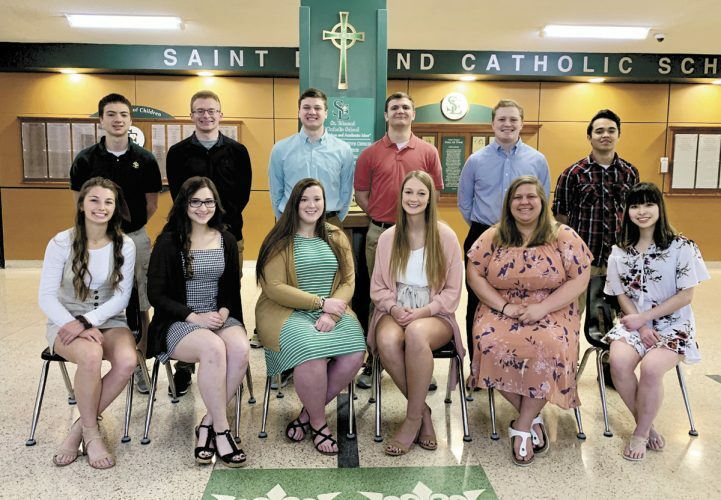 As part of the Young Eagles Program, McCartan and his wife have given over 500 rides to children ages 8 through 18 in the last several years — often during one of the breakfast fly-ins.